SAMUEL Laxton collected his first Plate winner’s trophy during the ninth legs of the Cuestars Under-21 Gold, Silver and Bronze Tours at Salisbury Snooker Club. The 14-year-old Portsmouth potter missed out on a place in the Silver knockout on frames difference. 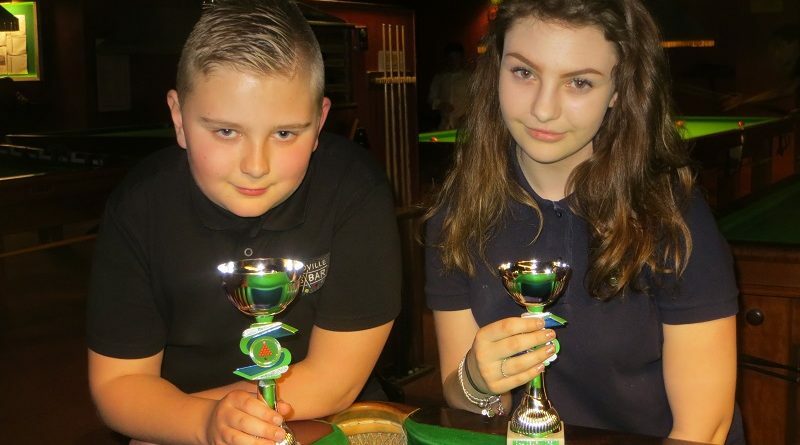 But he responded by beating Bronze player Katie Griffin (Swindon) in the final of the competition for the non-qualifiers among the 41 entries. Chandlers Ford SC hosts the tenth and final legs on Sunday, May 5. Visit tournament sponsor and snooker products supplier TopCue on the Downton Industrial Estate or at www.topcue.co.uk. PRELIMS: Steven Hughes (Chandlers Ford SC) beat Jaydon Elliott (147, Swindon), Chloe White (Waterlooville Sports Bar) beat Hughes, Samuel Laxton (Waterlooville Sports Bar) beat Eddie Mason (Salisbury SC). QUARTER-FINALS: Laxton beat Chloe White, Bradley Brewer (Salisbury SC) beat Dean Russell (Waterlooville Sports Bar), Katie Griffin (Jesters, Swindon) beat Callum White (Waterlooville Sports Bar), Ryan Kneller (Waterlooville Sports Bar) beat Kostas Ormerod (Chandlers Ford SC). SEMI-FINALS: Laxton beat Brewer, Griffin beat Kneller.